This is not easy, some guys are really good at countering with the left hook and moving their head and feet at the same time. They step back and fade away into safety and you become exposed as you come in short taking shots. Even if you have your hands up high you’ll get knocked off balance to the left if the guy has some ‘umph’ on his hooks. The better guys are able to throw two and three counter left hooks in succession, and a lot of guys with a good counter left will time it with your straight right hand, they will bring their left shoulder to their chin and block your shot and hit you at the same time. This is a slick move that guys used to pull on me all the time and I was able to add it to my own game as I got better. Think about the left hook for a second, what’s open when your opponent throws it? Well, the entire left side of his body is open. The top left side of his head is open and technically his chin and the whole centre of his face is open up the middle. For the most part you are going to nail this guy with the right hand, but at the same time that is exactly what he is hoping you will throw, so this is where the chess match ensues. The left hook counter is very safe counter when moving backwards. Especially for the taller outside fighter who counters with the left hook when you are throwing. I’ve found three good general techniques to launch an attack against a guy who has a fascination with the counter left, the key is rhythm and timing. I’ll explain each of them below. 1) Quick Jab and a power right hand to the body – Here you are trying to get your opponent to commit to a left hook by initiating the attack with a jab. You throw a quick jab, it doesn’t matter if it lands, the key is to finish your jab before he has finished the left hook and drop levels to throw the right hand to his open body, a fake jab works great, you are trying to draw out your opponent. A psychological tactic in boxing is to make your opponent think a technique will work on you and then try to get him to throw that technique, and then you answer with the natural counter. If you understand rhythm in boxing you’ll know that you stepping in to throw a full jab gives your opponent enough time to connect with a left hook. So you are going to throw a quick jab/fake jab while stepping with the left foot and then follow with a big right hand when your back foot catches up, it’s the classic one two combo. If he doesn’t go for your bait and just blocks, then GOOD, you just follow up with the left hook and other punches and step out when you are done, or hang inside if you are a good inside fighter. If he swings with the left hook and you have dropped nicely then your right hand will land, you will then step out to the right on an angle and start up a second attack. This whole interaction should take about one second or less. 2) Quick/fake Jab, slip head left, left hook and then straight right hand – Similar to the first tactic, you want your opponent to throw the left hook, he loves it and thinks he’s good with it, so let him think it’s going to work and take it away from him. In this combo you are only expecting to land the straight right, the rest of the punches are just a set up, this is the beauty of good boxing, the shot you intend to land is down the road and out of sight, but you know exactly what you are doing. So, you throw a quick jab to entice him to throw his hook, you slip left, and then come back into him with a big left hook and then **bamn** the straight right. When you slip left his left hook should graze you or even make contact, but since you are slipping in the same direction as the punch it will have little effect. 3) Double jab and straight right – This is not your typical double jab and straight right, you are going to barrel down and drive through him and aim your jab for his chest on the left side, it’s not as savvy as your classic double jab and right hand where you stand tall. Instead you are going to get a bit lower, drop your chin deep into your chest, raise your hands extra high almost like you are going to dive head first into this guy. You want to be extra protected because your goal is to take his left hook off the right glove and then throw your right just after you feel it. When you go in with this you are trying to be solid like a train on tracks, you want to throw the jab at his left shoulder or left part of his chest, this will open him up a bit for when you throw the right hand. He will throw his left hook and most likely two or three. After your double jabs connect with his chest/shoulder you are going to throw that right hand straight up the middle. You are essentially going to walk through the fire of his left hook in a compact position and throw the right hand after his left hook has fizzled out. Every now and then you’ll come across this guy, he is less skilled than you, doesn’t believe much in defense, has no patterns or combinations, and just comes straight ahead with rapid fire machine gun style punching. I’m not talking about rapid fire high volume punchers like Pacquiao or P. Williams, these guys have style and slick head movement and footwork to compliment their onslaught. I’m talking about the ignoramus who just comes straight ahead. The trouble is that he probably has a decent amount of endurance and speed, and if you are not sure how to handle this guy you might have to wait until the third round to really get his number, if you are having an off day then even that might not happen. These guys make can make you look bad as they unleash a fury upon you, and all the more so if they brought their girlfriend along to impress. There are three ways I’ve handled these guys, not all will work the same depending on the speed of your oppenent and your current level of fitness. These are fight strategies, general strategies that you’ll find work especially well against machine gun fighters of lesser skill. 1) Tighten up your defense and crowd him. The rapid fire puncher usually has no clue how to move backwards, let alone fight moving backwards, they expect you to follow the game plan that if he is going to come ahead you will either move back or stay where you are. This is perfect for him as he can guage distance (the way he does on the bag) and use momentum to chase you down as you retreat. The other thing he loves is a brawl, it brings you down to his level and negates the finer points of your game. So this is what I recommend, adopt a Winky Wright style defense, hands high, elbows tight to your ribs, forearms like pillars, make sure your hands are slightly open and the heel of palms are turned a bit inwards to prevent uppercuts from easily finding their way (see image below, I’ve left one glove off so you can see the position of the hand). Once you’ve adopted this posture move towards your opponent, walk into his punching range, and when he starts firing take another step closer. It helps if you can twist your body left and right to time and absorb the blows but it’s not necessary, try to make him feel uncomfortably close, if he tries to adjust the distance then get closer. Most often he will step back to gain space or catch his breath, and this is when you go on the attack. It’s very rare that I recommend leading with a straight right hand, but this is one of those times, the moment he steps back you step in and unload the straight right hand and left hook, if you connect then throw a few more shots and reset. I recommend staying close but walking to the right or left, don’t give him space, create angles. Most of all stay relaxed, and keep your eyes on his upper chest or neck, don’t let his onslaught throw off your vision. 2) Go on the run. If your opponent has poor footwork and has trouble chasing down a mobile opponent then use your lateral motion and quick in and outs to go on the run. Let him know that he is going to have to take risks to catch you, he’s going to have time you perfectly, and get you up against the ropes or in the corner to have a chance. I have most often used this strategy in the first round of a fight when my opponent thinks he is going to intimidate me with a barrage of offense and grunting. Don’t let it fool you, your skill and ability to weather this storm is the mark of a true boxer, stay calm and go on the run with tight defense, and don’t forget to return the favour a minute into the round. The beauty of knowing that you can outrun your opponent is that you can most likely catch him when you decide to go on the offense. 3) Punch when he is punching. This is a bit of Jeet Kune Do theory here, and boxing already has it built in. For the rapid fire puncher I would avoid throwing if he is in the middle of his attack, the best time to throw is when he starts. Do NOT stand still when you throw, either step in with your shot and intercept him, or step back and throw the left hook while stepping back. Don’t be a sitting duck. This applies all the time but be especially conscious of your chin and the non-punching hand. If you are going to walk into a fire of punching then stay tight, this is not a time to be loose and slick. I have a quick motto that I tell myself when I’m training, it goes like this, ‘head hands feet’. I repeat this to myself during my workouts every now and then to remind myself that I should be moving at least one of these three things at all times, ideally you should have two or three moving. You’d be surprised how many good boxers don’t adhere to this and have limited their potential. For example, ‘head’ and ‘feet’ means you are slipping punches and moving to create angles. ‘Hands’ and ‘head’ means you are slipping while throwing shots. ‘Head, hands feet’ means you are punching while moving in with your feet and slipping your opponent’s shots. Either way, the specific grouping is not important, what’s important is that your training and your boxing is dynamic! Constant motion, ‘head hands feet’. This is how to fight to be superior, and this is how to train to win. When you look at your boxing combinations there is a lot at play: ryhthm, footwork, head movement, angles, fakes, set ups, punches, counterattacks, speed, conditioning and situation; there’s much more involved than just punching. Punching is the fun part, it’s easy. Getting to your opponent safely, striking, and then moving out of danger is the hard part, he’s not going to take it lightly that you are coming in to knock him out. Below are the stages of a real boxing combination, all your combinations in the gym and in the ring should have elements of each part, train with these components in mind and don’t stray from them. 1) Opening rhythm. There is rhythm in boxing, it’s not a dance beat, it’s a serious of broken sections of beats that are fast, medium and slow. Your footwork, head movement and speed all set the pace for each attack. When you are in front of your opponent you are expressing your rhythm, you are faking, stepping in and out quickly (pendulum steps), rocking your head back and forth, posing, circling your hands or keeping them tight to your chin. Before your throw any punches you want to eliminate the chance that your opponent can time you coming in. Before you throw, fake with your head, fake the jab, step in and out and then back in, circle your opponent to the left and to the right etc. The last thing you want to do is stand still and come straight in, even advanced boxers tend to revert to this. 2) Jab. Most combinations start with the jab and I advise it 80% of the time, the trick is not to throw the same jab over and over again in the same way. Slip your head left then jab, slip right then jab, jab to the lower chest then to the head, jab to your opponents jab hand and then jab to the chin, throw a backhanded jab and then come through with the right hand. Mix up your jab’s power from a snap to a thrust. Read your opponent and mix it up. 3) Throw your combination. Most boxer’s rely on a set of combinations that work for them and I advise this, you need to have ‘go to’ combos that your mind will think of in the heat of battle. Believe it or not, the simplest combinations can work on the toughest of fighters. 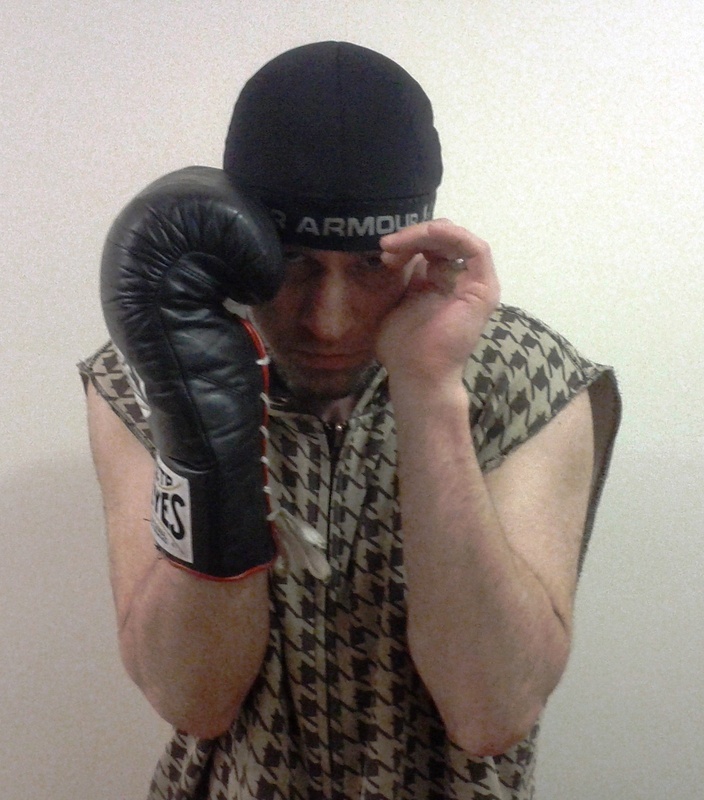 In all my boxing I have had more success with this combination than any other – jab, jab, straight right, left hook. Not to fancy, but it works. This combo alone is not good enough though, you need a lot more. You have to understand that combinations are not just a string of punches, there can be quick breaks before you restart your attack. For example, jab, straight right, slip your head right, straight right, left hook. In this combo I applied the pressure, I then took a quick break by slipping my head to the right, in this break I am able to take an extra step forward and avoid any counters from my opponent, I then resume my attack. It’s all about rhythm again, you need to learn to throw a quick combo, move your head or step to a new angle and then restart the assualt. The biggest problem beginner and intermediate boxers have is that they only throw one set of punches at a time. Once you learn to throw a combo, move your head and feet, and restart all in one flurry your boxing will see new heights. 4) Step back and move to an angle or step out to the side. Once you are finished your combination it’s essential that you don’t just lay there, you need to step out of danger and this has to be a part of all your combos in the gym. If you don’t practice this way then you’ll be a sitting duck come fight time. The only reason to stay put after your combo is if you know you are a better inside fighter and intend to stay there. After spending energy on your combination you will need a brief recovery period of a second or two, this is your opponent’s best time to attack you and the time where you need to let him know that you won’t be easily caught. Once your combo is done, step out. If you step back make sure to immediately step to the side, don’t step straight back and stand there. The jab is the king of all punches, it’s versatile, it sets up the big ‘payday’ shots like the right hand, left hook, and uppercut. You can throw it while moving in almost any direction and it leaves your balance in tact. It goes without saying that having a good jab can take you from average to above average, and from good to great. What constitutes a good jab lies in how you deliver it, your ability to use it frequently to clear the road ahead, and to apply it in various scenarios to suit your purpose. The jab is a thinking man’s (or woman’s) punch. The delivery of the jab is critical for both your offense and defense, you need it to be fast and efficient to set up ensuing shots while at the same time leaving you covered against potential counters. Here are some absolutely essential aspects on delivering the jab. 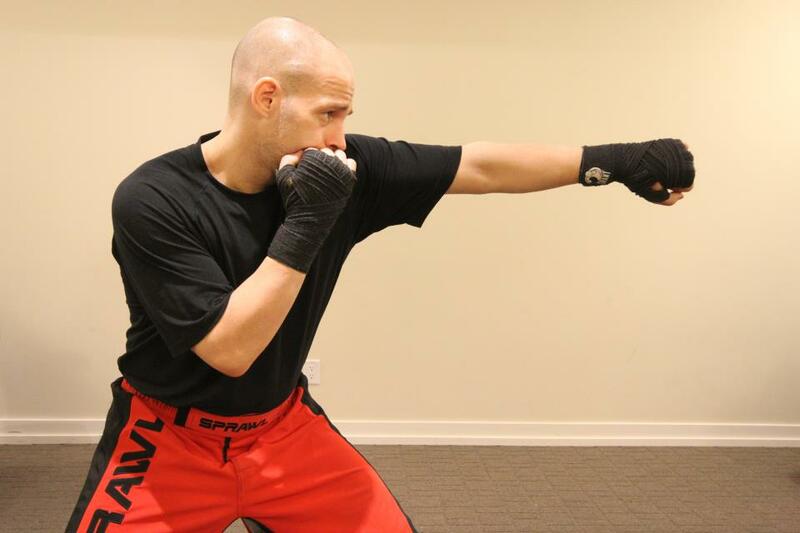 1) Keep the elbow down until the last second when you deliver the jab and extend your arm. A flared up elbow will leave your jab coming sideways (in some cases you will want this, but not for a basic jab) and it will also leave your jab a bit short, throw that jab with the elbow down and deliver it like it’s being thown down a pipe. 2) Turn the fist over. There is a time and place for the backfisted jab and the intentionally misplaced jab, in most cases however, you need the jab to come straight through to the opponent’s chin. When you turn the fist over with your pinky finger facing the ceiling your shoulder will roll up that bit higher to protect your chin. Of course, you also need to remember to tuck your chin like you’re holding a wad of cash to your upper chest. 3) Do NOT drop your fist even in the slightest upon delivery. This is the biggest mistake I see beginners make, they drop their fist an inch or two from their face before throwing the jab straight out. The only time to drop the hand before throwing the jab is when you’re faking a punch and are following up with something or if you are in a position with your hand down. To train this habit, get yourself close to a mirror, right up close, just couple feet away. Throw a hundred spontaneous jabs and keep your eyes on your punch. It should come out almost like you are punching over a table that is at the height of your neck. Do NOT drop that hand. 4) Twist your body and extend your shoulder so that your back is rounded on the jab side, you want to stretch your shoulder blade forwards. Just doing this will put your shoulder to your chin when you finish the shot to give you extra coverage. 5) Do not move the right hand when you jab, it should be planted on your face with your upper arm resting comfortably on your ribs. A lot of fighters pull a ‘shot gun’ pose when they jab, it’s easy to catch these guys with the left hook. Some fighters open up their arm near the ribcage and are susceptible to a counter left uppercut. Don’t give anything away for free, you can prevent a lot of shots from scoring simply by keeping the opposite protective hand in position. To train this you need to spend time shadowboxing and thinking about the non-punching hand when you throw combos. Bodily self-awareness is critical in boxing. 6) For most jabs your arm should be loose and relaxed, and the punch should snap without telegraphing. The best way to train this is to train in front of a mirror and watch yourself for telegraphing cues. Your hand snaps and the rest of you is calm like an unrippled pond. This doesn’t mean that you aren’t moving the rest of your body, it just means that you are in a rhythm and do not have any fist pumps or tensing up that gives you away. In your mind you are thinking “stay loose, maintain rhythm, and fast delivery” That being said, not all jabs need to be loose and snappy, sometimes you need to stiff arm them just a bit to drive somebody back, the key is to apply force without leaving your arm extended for longer than a millisecond. You are currently browsing the archives for the Punching category.